This figure first appeared in Canada on the Return Of The Jedi 77 back card, but debuted on the Return Of The Jedi 79 back card in the United States. This figure didn?t get released in Europe until the Tri-Logo70 back card and because of that this figure, along with Paploo are often referred to as belonging to a wave known as ?The Last Seventeen?. Comments: Technically speaking, Lumat was the last figure released as a Return Of The Jedi figure in North America. This little scrapper and Paploo were the only new figures to see release on the Return Of The Jedi 79 back card, which was the last card back before The Power Of The Force line debuted. Since Lumat is pictured after Paploo, and he didn?t get to do anything as cool as scoff a Speeder Bike, he gets the honour. Major Variations: Though all vintage figures have minor variations, the Lumat has no known major variations. Many people new to vintage collecting often mistake Lumat for Warok, or vise versa. Because both figures come with very similar accessories, and share roughly the same colour tone, they do appear very similar at a casual glance. As such, there are a few easy differences to spot. When stripped of all accessories, one can notice that Warok?s head tilts to the left and there is a light coloured belt sculpted to the torso, while Lumat?s head looks completely forward and there is nothing save fur sculpted to the torso. 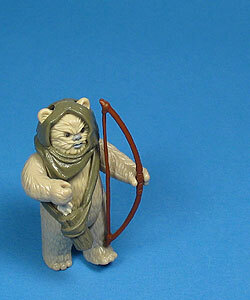 Lumat?s Ewok Quiver sports two white painted arrows, where Warok?s has four unpainted arrows. Another tip to spotting Lumat?s Ewok Quiver is to note the colour, unlike Warok?s, Lumat?s quiver is moulded in the same plastic as its hood. In the case of the bows, Lumat?s intended bow is moulded in light brown plastic, and Warok?s is moulded in dark brown plastic. There are many reproduction bows out there, and such it is vitally important to know that neither bow was ever moulded in any other colour. Of all the reproductions known, the one to come about the most often is moulded in gray plastic. 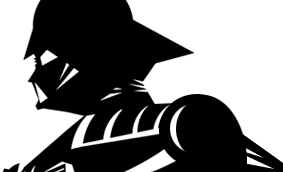 It is important to note that there are some Tri-Logo carded examples of Lumat with a dark brown moulded bow, but when considering that both Lumat and Warok were being packaged and shipped in Europe at the same time, it is likely that these are packaging errors, but there is a chance that they may have been intentionally substituted during a theoretical length of time. It is impossible to say how many were incorrectly packaged, but to date there are no known carded examples of Warok with a light coloured bow.